Safely transport dangerous goods on inland waterways. In LOCOPIAS, extra measures have been taken to ensure ease of use and regulation compliance for vessels transporting ADN goods on inland waterways. Adapted to the needs of IWW shipping. LOCOPIAS has been designed to support all types of vessels and waterways and comply with local regulations. 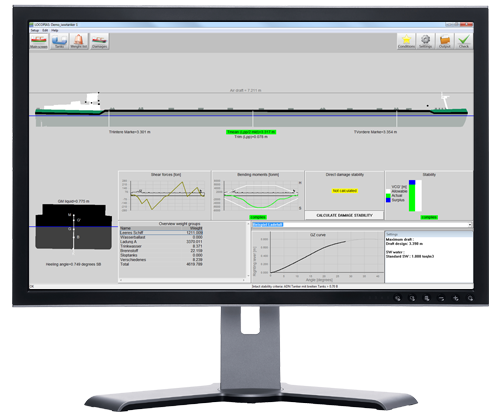 LOCOPIAS thus also provides functionalities specifically developed for the European inland waterways. LOCOPIAS allows you to check your vessel's intact stability and longitudinal strength among other things, thus allowing you to check your compliance with ADN regulations before you set sail. With LOCOPIAS on board, optimizing your load to comply with regulations is easy. LOCOPIAS has been approved by Lloyd's Register, IVW, Bureau Veritas and Germanischer Lloyd. With LOCOPIAS on board, you can easily answer 'yes' to all relevant questions on EBIS inspections. Last but not least, LOCOPIAS fully complies with all recommendations found in the WSV Waldhof research report. Configure LOCOPIAS for your inland vessel. Our maritime experts recommend the following LOCOPIAS modules for inland vessels.